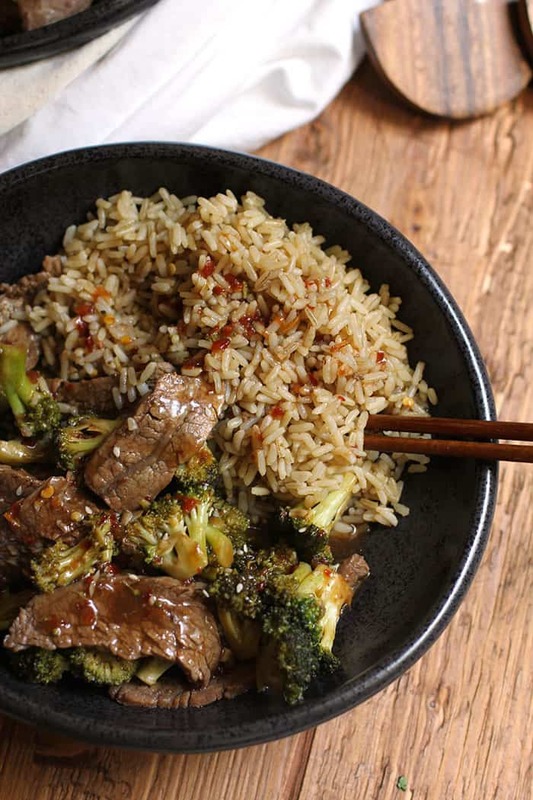 Ditch the take-out, and try this easy Beef and Broccoli Stir Fry instead. It’s healthier, cheaper, and you’ll know exactly what ingredients you are putting into your body. Brown rice is my favorite, but white is fine too! Zach’s favorite restaurant is a local family-owned Chinese restaurant about 1/2 mile from our home. He and his friends love it, just like Josh and his friends did back in the day. I always like to try a bite of it when they bring home take-out. But let’s be real here. Most Chinese take-out places do not serve healthy food, for the most part. Zach’s usual, Sesame Chicken, IS tasty – but it’s fried and covered in a very thick sauce. 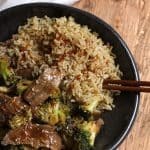 My Beef and Broccoli Stir Fry? NOT fried with a lighter sauce, but still very good. Flank Steak is one of my favorite cuts of beef to cook with. I used it in my Flank Steak Fajita Salad and it also makes awesome tacos and burritos. Flank steak is a cut from the abdominal muscles or lower chest of the cow. It comes from a well-exercised part, and can be tough unless it’s cut across the grain, sometimes marinated, and quickly cooked and then thinly cut. 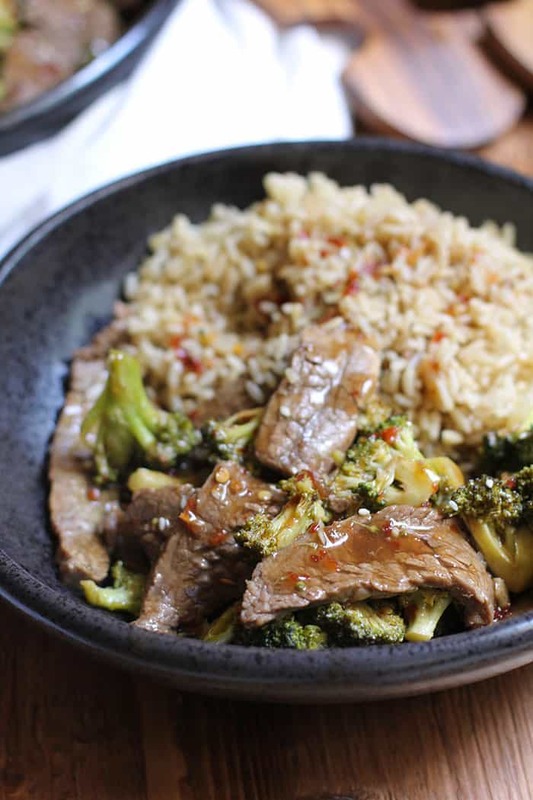 For my Beef and Broccoli Stir Fry, I cut the steak very thin, across the grain – for more tenderness. Slicing in thin strips is also great for quick meals and it only took a few minutes for it to cook. Just lay strips in single layer on hot wok (or skillet), cook until brown on one side and then flip to do the same on the other. The meat will cook a little bit more in the last step of the process, so no need to cook completely through. A little pink in the middle is actually a good thing. I went heavy on the broccoli florets (8-10 cups) for my stir fry because they cook down SO much. The leftovers are great too. Do you know what I LOVE the most (well, beside the flavor) about Chinese food? I’ll admit, I’m not very good at using them YET, but I’m working on it. They can be challenging, especially when scooping up rice. But don’t you love how using them feels more authentic? There are chopstick etiquette rules to follow as well, depending on the country you are in. You can find a package of nice chop sticks at World Market. They are great to have on hand. For some other Asian recipes, try my Shrimp Fried Rice or my Baked Asian Salmon in Foil. Both are equally great, but totally different. Who needs take-out anyway? 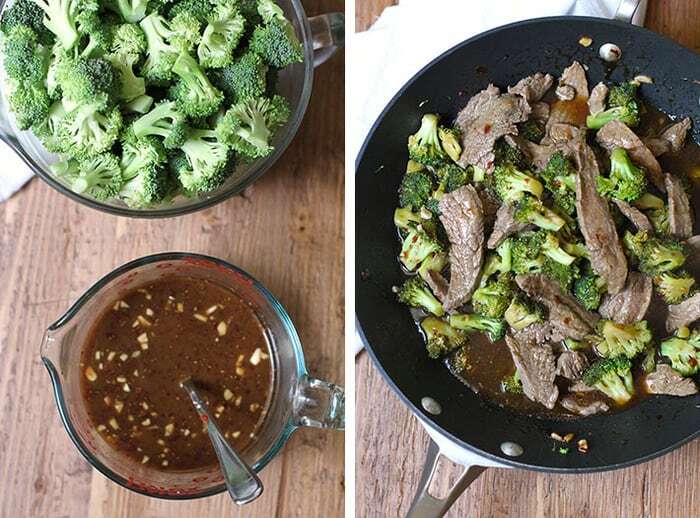 Ditch the take-out, and try this easy Beef and Broccoli Stir Fry instead. It's healthier, cheaper, and you'll know exactly what ingredients you are putting into your body. Prepare the rice according to package directions. I use Uncle Ben's long grain brown rice, but you could use any rice you prefer. 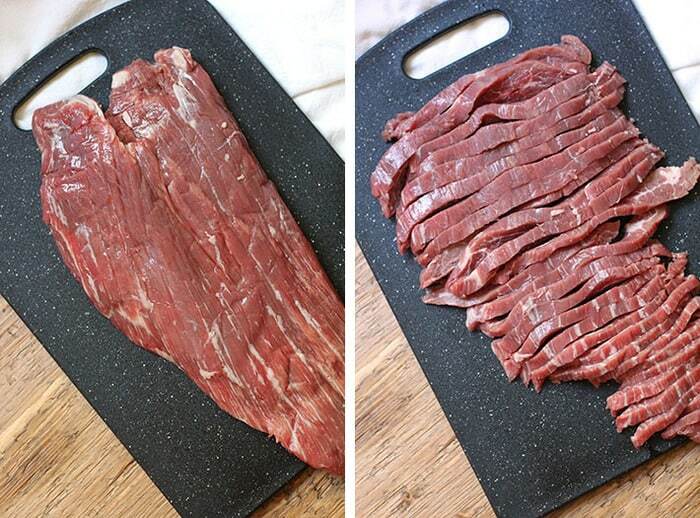 Slice the flank steak in thin strips, cutting against the grain. Set aside. Clean and trim the broccoli into small bite-sized florets. Set aside. Prepare the sauce, by mixing all the ingredients above. Set aside. Heat a large wok (or can use skillet) to medium high heat. Coat with canola oil, and add half of the steak in one layer. Cook for approximately two minutes per side, and remove to plate. Repeat with the remaining steak. Add more canola oil to wok and then the broccoli. Sauté for a few minutes and then top with the sauce. Simmer for 4-5 minutes, or until broccoli starts to soften, and then add steak back to wok. Simmer for an additional minute or two, or until sauce thickens. Top with a teaspoon or so of sesame oil and stir. Serve over rice and add some toasted sesame seeds or chopped green onions (optional). 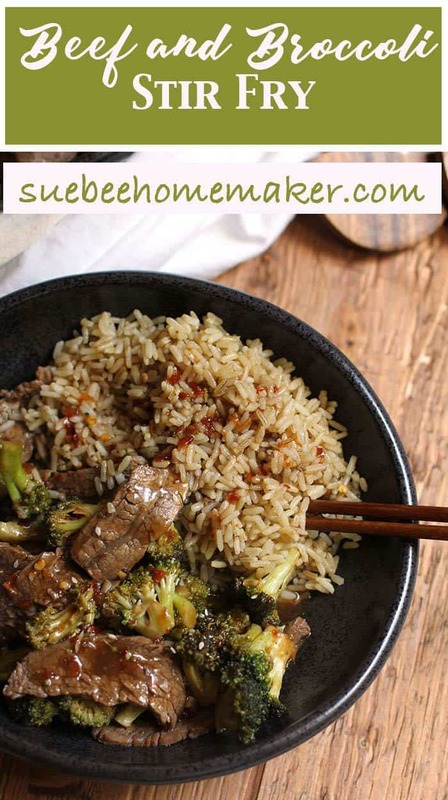 I love Stir Fry and I am glad that you have a healthier version! I love this recipe, but I am out on the chop sticks. It takes so long and the food is soooo good!